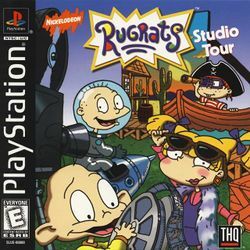 Rugrats Studio Tour is an adventure game that was developed by N-Space for THQ, and released on the Sony PlayStation, on November 10, 1999; as the name suggests, it is the seventh title for the Rugrats series, as well as the third one that can allow up to four players to play on it simultaneously. HOLLYWOOD, HERE THEY COME! Take off on an amazing movie studio tour with Dil and the entire Rugrats gang. This page was last edited on 14 November 2016, at 16:30.